Munson Valley Road winds its way up the mountain's slope. Forests of lodge pole pine give way to mountain hemlock as I gain nearly 2,700 feet in elevation on my way to the rim of Crater Lake at 7,100 feet. What makes this route different from any park road I've traveled before is snow – lots of it. It is mid-winter, and the banks are so steep on both sides of the road, it feels like driving in a tunnel, or maybe a canyon with cliffs formed of snow instead of rock. I've decided to see the lake dressed in winter white. When I arrive at Rim Village, the vivid blue water is set off magnificently by the deep green of old-growth hemlock and a clean white blanket of snow on the caldera rim and wall. I head out on cross-country skis along the West Rim Drive Route towards Discovery Point. The views are breathtaking and well worth the trip. At high elevations in the Cascade Range, winter storms from the Pacific drop their moisture as snow. An average of 524 inches (that's more than 43 feet!) falls each year at Crater Lake. Rim Drive closes in October and may not be fully open again until July of the next year. The lodge closes for the season at the end of October and by mid-winter is buried in snow up to its second or even third story, but lodging and services are available in the neighboring communities. 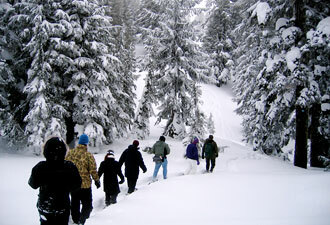 Hiking trails rest under a blanket of white up to 15 feet deep. But the park is open all year. How is that possible? In the winter, two shifts of drivers plow the roads beginning at 4:00 each morning until 8:00 each night, diligently working to keep the south entrance and Highway 62 open in both directions. When the heaviest storms come, the last three miles from park headquarters to Rim Village may be closed for a day or more, preventing lake viewing. 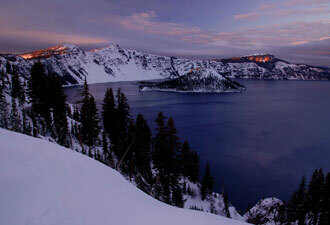 As you might imagine, winter driving at Crater Lake can be extremely challenging. Tire chains or traction tires are a must much of the season. All-wheel drive is most helpful. Check for weather or road current conditions online or by calling 541-594-3000. Be sure to fill your tank before heading up the mountain because there is no gas available in the park during winter. 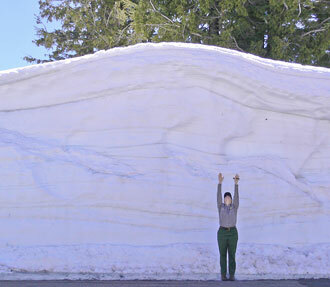 Although snow does close portions of Crater Lake National Park, it opens the park in other ways. Winter enthusiasts explore on skis or snowshoes, bringing layers of fleece, extra calories, and cameras. There are many miles of marked cross-country ski and snowshoe trails, with choices for all skill levels. Visitors who wish to explore the snow on ski or snowshoe should inquire at Steel Information Center which trails would be best for their level of experience. The Crater Lake Ski Patrol, a highly skilled volunteer organization, patrols every winter weekend, marking trails, breaking trails on the most popular routes, and providing medical attention and technical rescue when needed. If you're new to winter sports and want to ease into the experience, sign up at the park visitor center or call 541-594-3100 to make reservations for a ranger-led snowshoe hike, given every Saturday and Sunday from December through April (weather permitting). Snowshoes are provided. Come enjoy this winter wonderland!